Meet our dedicated & curious team of teachers that love children and STEAM with a big dose of fun! Anubha is a Mechanical Engineer and a former researcher at Columbia University with patents & publications. She is very curious and loves science, art, children, exploring new ideas & sharing them. She absolutely loves spending time in nature. Her passion in life is to share her ideas with children, introduce them to new possibilities and help them discover their path in life. Liana was born in Israel and came to the U.S.A. at the age of five. She remembers a lot from her adjustment period. These memories help her when she is working with other children who are also in new environments and cultures. Liana graduated from Weehawken High School and continued her education at Hudson Community College, graduating with honors. She then graduated from New Jersey City University with a dual degree in Elementary Education and Geoscience. She loves animals, nature, baking, and working with children! Writer-illustrator, Wallant grew up in a family of artists and storytellers; a student of folklore, children's literature, and semiotics. Wallant wrote poetry and later advertising copy. After art school, she worked as a designer, illustrator, and wrote and illustrated several children's books. Wallant's path led her into product design specializing in toys, athletics, and housewares. She offers inventor consulting and teaches design and STEM eduction. She lives in Westfield, New Jersey with her husband. Mona Elgendi is a student who hopes to, in the future, study pharmacy. Her interests include biology, photography, and geography. Shreya Bajracharya is a student who hopes to pursue a future career in the medical field. She started working with children at the age of 15 and has continuously worked with them extensively. Her favorite subjects are science and math. Hong works as an intern for Curiosity Lab. Her main goals at Curiosity Lab are to interact with the kids and help them learn about the world around them. Her interests include science and the fine arts. 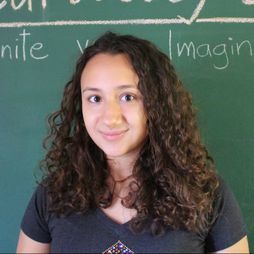 Serena is one of the interns for Curiosity Lab and is a senior at Secaucus High School. Her goal at Curiosity Lab is to inspire and teach kids about technology, especially in the technology-driven society. In her free time, she likes to bake and watch films.